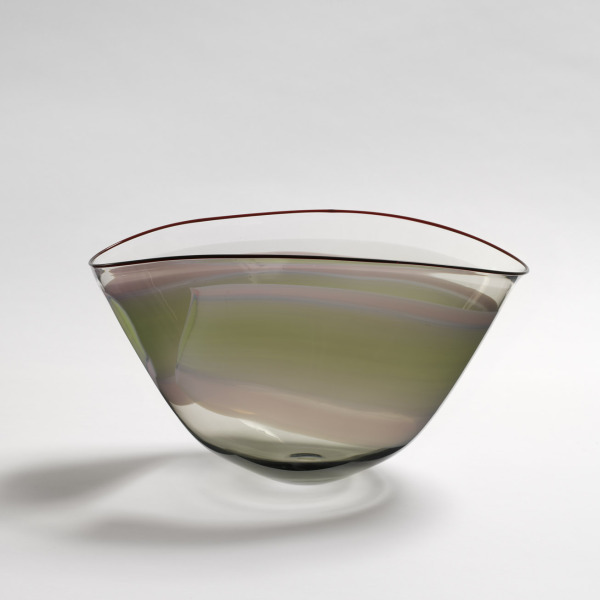 Oval-shaped clear glass bowl with horizontal colouring of pink, purple and light green, with an undulating rim. Flat rods of layered colour are produced prior to the manufacture of the piece. A section of rod then heated and applied to the hot glass. The colour is 'cased' between two layers of clear glass, then blown to its full size once the colour has been fused in. Oval Bowl, Annette Meech, 1984, Crafts Council Collection: G32. Photo: Todd-White Art Photography.